The modified Hyundai Ioniq electric car is a one-off, and Hyundai has clarified that it does not plan to introduce contactless technology as a mainstream feature. 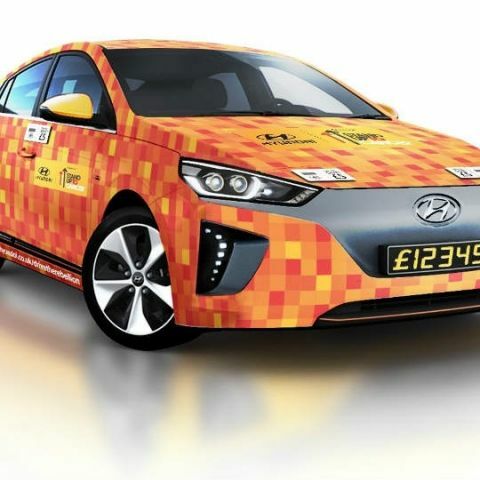 Hyundai has unveiled the world’s first ‘contactless car’ - a modified Hyundai Ioniq that will be used to contribute to the ‘Stand up for Cancer’ charity. The car has five contactless payment points on its body, on which anyone interested can donate to the charity cause initiated by Cancer Research UK. Donations can be made in the range of £5 and £10, and once a payment is made, there will be an audio-visual thank you message relayed to the donor. Other elements in the modified Hyundai Ioniq will include a digital plate to the front of the car that replaces the number plate and show the total amount of donations received. There will also be a photo booth inside the car that will instantly print photographs of donors, which can then be stuck on the exterior of the car. The special edition Hyundai Ioniq will be unveiled at King’s Cross station, London in May, and will go on a road show across the United Kingdom till November. Contactless car technology has not really hit mainstream application, and the Hyundai Ioniq will be among the very first cars with some sort of contactless payment technology implementation. Jaguar implements a different version of contactless payments in its newer car models like the F-Pace SUV and the XE sedan, where users can make payments at Shell-operated garages for refuelling and other tasks, from the infotainment console. The new InControl Pro infotainment setup is the latest upgrade to the array of technology employed by Jaguar in its cars, and although it has selected implementations for now, it has the framework to support more payments in future. The new contactless zero-emission Hyundai Ioniq was conceptualised after public response was seen in favour of contactless donations following a trial run of the service in 2016. Despite that, Hyundai has stated that contactless payments will remain a one-off inclusion for now, and will not be included as a mainstream feature in its upcoming cars, for now.